The SEO Marketing Plan that will WOW your Boss. Writing Company Profiles, the Right Way. Food truck fever is sweeping the nation! I mean, what’s not to love about a quick bite of lip-smacking food that is parked right outside for easy access?! The sheer convenience and varied delight of this basic necessity is no wonder we’ve watched this niche grow heartily into the next best thing since sliced bread. But what the heck does this have to do with Social Media Marketing? This fundamental description refers to exactly what both users and business owners are expecting from a healthy Social Media Strategy. Yet very few companies are actually delivering this kind of experience. It’s no wonder pages sit stagnate with little to no organic customer interaction. Food truck owners are creative entrepreneurs that have been finding new ways to bust the jello mold for years, and it doesn’t stop with a mouthwatering menu. It’s now spilled over to pushing the social media marketing limits as well. Heck, the 2014 movie Chef was peppered with delightfully fresh out of the box Social Media Marketing ideas, 20 in fact, that have caused marketers to indulge in a new found sense of creative marketing like never before. So let’s not just continue to admire these tactics from afar just because it’s not what other Social Media Marketers are doing. Let’s implement the opportune structure of the food truck itself. There is a reason these mobile food havens have become so finger licking good and it’s not just because of what’s on the menu. 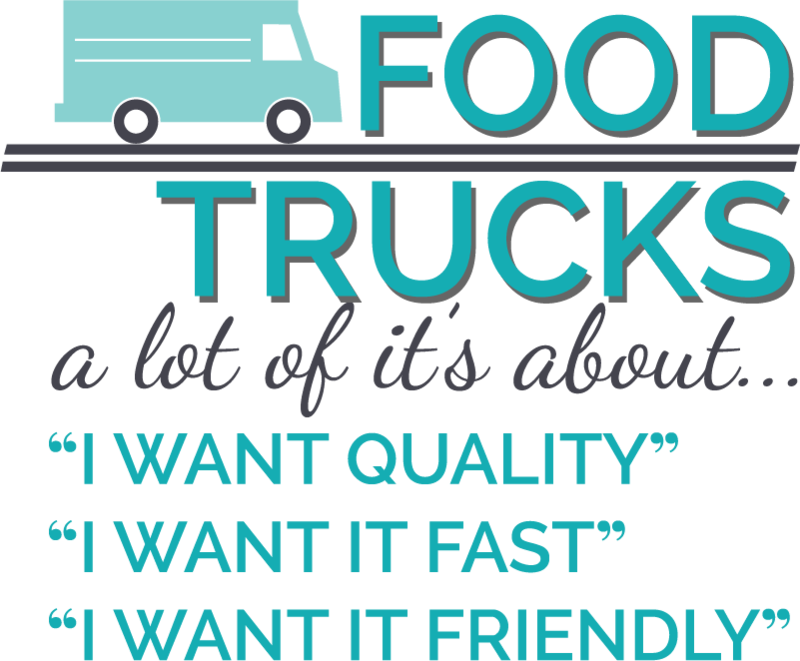 In an article by the Food Truckr, Mindy Holahan breaks down the simplistic elements that have accredited the food trucks overwhelming popularity. I’ve chosen to apply her core classifications to social media based on the trending changes currently taking place in digital marketing. I believe these to be the same core principles that will shape the future of Social Media Marketing. 1. The permission to specialize. When it comes to social media a lot of business owners don’t feel the freedom of individuality. Its difficult do decide where to turn for help, because “aren’t all social media companies offering the same thing! ?” Well, you just answered your own question. If the status quo is being offered to you, it’s probably not a going to bring a meaningful impact to your social efforts. Do me a favor; randomly look at 10 different Facebook pages. Chances are 9 of them function the same exact way. You’re sure to find little creativity, little interaction and even worse little profit produced. The mobile marketer should not offer a one size fits all integration. Analysis skills allow the mobile marketer to dissect all the best parts of a company to create a smorgasbord of engaging content; customized based on how your customers are already interacting. What can I get you? 2. The joy of discovery. The best experiences I’ve ever had came from an unexpected discovery that jolted the day into an enchanting event. Although no one can create this with every piece of content, new customers should feel similarly when they stumble across your online content. Great content prompts others to share because they want to recreate a special moment where others can delight in the joys of their discovery. A social analyst has the ability to discover hidden creativity that has been long lost and just waiting for a chance to entice again. Orders up! 3. The sense of community. Without a community, there is no social media. Social Media platforms are not, yet another, outlet to blast your one way message. If you guilty of doing this more than 10% of the time I can guarantee your page is sitting lifeless. Don’t become stagnate due to a lack of community. Opportunities to build your community must be considered and planned; it’s not something that “just happens.” Did you know a food trucks menu is vague for a reason? The owners want to create a situation to have meaningful interaction with their customers. Do you want fries with that? What I’ve learned from this experience is the importance to go outside your industry for inspiration. In fact (as you can tell), I highly recommend it. Chances are your competition isn’t looking at how a business three industries over is conducting itself. But you can be! These kinds of out of the box ideas are what causes companies to stand out and build passionate communities that market for them. Once customers get a taste, they can’t help but come back for more. I challenge you to watch this 11 minute food truck documentary. Before you do, put on your “Social Media Marketing” goggles and analyze each of their tactics. Report back with any neat inspiration that was stirred up in you! What if a marketer was this mobile? Great news; I am! If you’re in the Wichita area, I’ll be glad to drive my mobile over for bite size action steps you can use right now to start creating a community that markets for you. Get a head start with my FREE Social Network Analysis. The Unconventional Guide to Discovering your Target Audience. Omission based Marketing is Unethical, Here’s Why. Is New Marketing Really, Better Marketing? Is Your Brand Ready to be Seen at Sloss Tech? Learn About Effective Strategies, Content, Your Audience, Analytics & More! ® 2014 – 2017, Sarah Stahl. All Rights Reserved.